You’re happy and feeling in control for two to three weeks and then something shifts. You feel moody, hungry, puffy and tired. Your period is coming and although you’ve been dread­ing the symptoms, you’re also looking forward to it because soon you’ll be back to your true self again-back in control. A couple of more weeks go by and those dreaded symptoms return. Rinse. Repeat. If this sounds exhaustingly familiar, you’re not alone; 75% of women report symptoms of pre-menstrual syndrome (PMS). What many don’t know is that it’s not the men­strual cycle per se controlling their lives-it’s the hormones that guide the menstrual cycle. There are simple steps that can help reduce symptoms by keeping hormones in balance. You can start today. The first step in playing an active role in hor­monal health is to understand the basics. A quick refresher in middle school health class is in order! 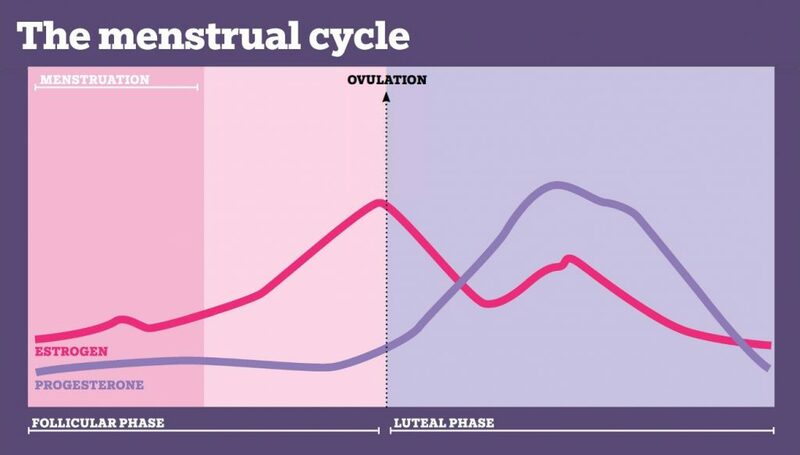 A normal menstrual cycle is 24 to 35 days long and has two phases: Follicular and luteal. In the first phase, estrogen levels rise as the body prepares to release an egg, also known as ovulation. Ovulation marks the start of the second phase, in which progesterone levels rise. When the egg is not fertilized by sperm (and no pregnancy occurs) progesterone and estrogen levels decline, you get your period and the whole cycle starts over. The intricate rise and fall of estrogen and progesterone, along with a few other key hormones sent from the brain to stimulate ovulation, make each woman’s cycle unique. This careful hormone balance is also the difference between a happy period and an unhappy one. If estrogen levels are too high or too low in phase one, progesterone levels are affected in phase two, and vice versa. These slight hormone shifts can have a huge impact in our bodies, causing symptoms that include premenstrual head­aches, mood fluctuations, heavy periods, unwanted hair growth, digestive upset and difficulty getting pregnant. But both estrogen and progesterone help cells respond to insulin, so changes in these hormone levels can trigger fluctua­tions in blood sugar and lead to cravings, weight gain and fluid retention too! Falling progesterone towards the end of the men­strual cycle has also been linked to these increased symptoms of PMS. A hormone cascade is series of interdepen­dent biochemical reactions. The interaction between a hormone and its receptor (where it binds) triggers a cascade of reactions that cause production and release of other hormones. If you make a change to a hormone higher up in the cascade it will have a ripple effect all the way down. However, it’s not always a top down effect. Some of the hormonal movement can go back and forth, and some act in the reverse direction. On top of all this is testosterone, a hormone often under-represented in the female health picture, surges around the time of ovulation and before menses. If testos­terone levels are too high, a female can experience irregular or absent periods, excessive hair growth, acne and difficulty getting pregnant. Well, that’s where you come in. Hormone changes are also a result of disrupting factors like emotional and physical stress, nutrient deficiencies, blood sugar imbal­ances or environmental factors. It is time to empower yourself. I treat women with hormonal imbalances in my practice on a daily basis, and I am continually amazed by how responsive the body can be to minor changes we intro­duce through natural treatment methods. Sometimes just one change can correct an imbalance, but usually a combination of diet, lifestyle and supplements is required to support, regulate and truly take control of your system and cycle. But where to start? Basic blood, urine or salivary testing can tell you what you’re your hormones are doing, but no matter where you land on the hormonal cascade, there’s no reason you can’t start building balance in your body today. Follow these five simple steps. Then be on the lookout-you should start to feel a dif­ference within a few weeks. A healthy daily dose of dark leafy greens and vegetables from the cruciferous family helps eliminate excess hormones in the gut. Think broc­coli, cauliflower, Brussels sprouts and kale. Cruciferous veggies also contain Indole-3-Carbinol (13C), an ingredient shown to support the liver’s job of cycling estrogen. Take it one step further by adding 2 Tbsp of freshly ground flax to your daily diet and limiting sugar, dairy, salt and refined carbs as you eat more healthy proteins and good fats. Think legumes, fish or grass-fed beef and olive oil, avocado, nuts and seeds. These foods help regulate blood sugar and decrease symptoms of PMS. If you experi­ence breast tenderness, consider cutting back on your caffeine. Not actually, but try to reduce your stress. Stress can single­ handedly derail your menstrual cycle. The major player in the body’s stress response is cortisol, which spikes when we’re stressing or skimping on sleep. Cortisol can “steal” from progesterone, pushing down those levels and moving the whole cycle out of balance. Estrogen then dominates in the menstrual cycle and contributes to height­ened symptoms of PMS due to the more pronounced highs and lows in its levels. Making sleep a priority, doing things that make you laugh, and focusing on deep breathing when it just gets too hectic are simple actions you can take to manage stress. Exercise regulates blood sugar, decreases inflammation, boosts serotonin levels and supports healthy sleep. Women who do 30 minutes of cardio three times per week improve all PMS parameters. If your testosterone is elevated, exercise can get to the root of the problem by regulating blood sugar and decreasing insulin resistance. Try reducing your use of plastic containers and choose fresh instead of canned foods, as most are plastic lined. Plastics have been shown to contain hormone-altering chemicals like BPA, which can mimic estrogen in the body, as well as phthalates, which are linked to changes in testosterone levels. Medical literature links BPA to everything from breast cancer to reproductive problems. Vitamin and mineral supplements support healthy hor­mone production. B6 plays an integral role in estrogen and progesterone metabolism, and helps the brain make serotonin and dopamine. Studies show that magnesium helps regulate cortisol levels, lower blood sugar and aid in sleep. Magnesium is also involved in the production of progesterone, estrogen and testosterone. Like so much of naturopathic medicine, bal­anced hormones and a menstrual cycle that you control-not one that controls you ­comes down to three elements: One part science, one part common sense and one part self-control. If you are empowered with the right information and the right motiva­tion, you can hold the reins of your menstrual cycle. I suspect that if you are reading this magazine, you’re already start­ing to.